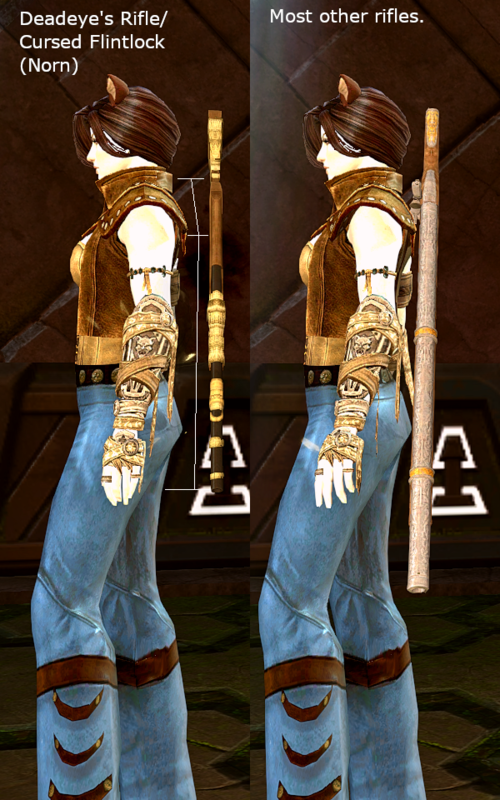 Problem: The holographic effect on the outfit doesn't show up as the correct dye color on female characters. When wearing it, it glitches and keeps changing colors. The Sloth back skin has strings hanging from its rear... This is GEM purchase item and should be priority fix in my opinion. Equipment: Vigil's Honor Leggings, Wolf Vest, Wolf Bracers, Wolf Boots, Lunatic Noble Shoulders, Bloodstained Lunatic Noble Mask. Astralaria, Molten Warhorn, Fire Quiver Backpack. All level requirements 80. 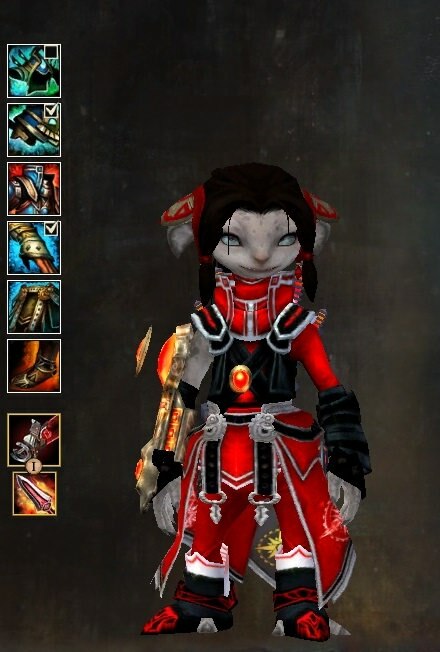 All equipment transmuted from Zehtuka's Ascended armor. Astralaria and my warhorn are clipping quite deeply into my thighs on this character. I tested other hip weapons out on other professions with norn females. No issues. This was not an issue before the last patch. All hip weapons are bugged in this way on this character ONLY. Upon further testing, it appears that the Wolf Vest chestpiece is causing the issue. Issues: -Savant Chest Overlay your shoulders pads, you can't use what you want since it don't appear, The savant shoulder pads appear instead. -Savant Helmet delete your hairs, it's a serious issue, Zojia could have hair so. -Genius Chest cuts your gloves, "overlay" them, instead of having a gauntlet I have a very small glove. 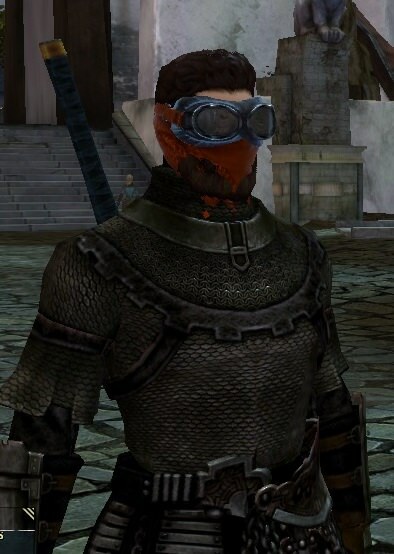 Issues: Beard clipping through medium armor facemasks, does not do this will all facemasks. Stay low. Move fast. Kill first. Die last. Description: as you can see in the pictures, I noticed that most of the old clothes show that terrible seam on the waist and I thought it was bcz of the "Winged Pants" but rather its in most of the revealing skins. 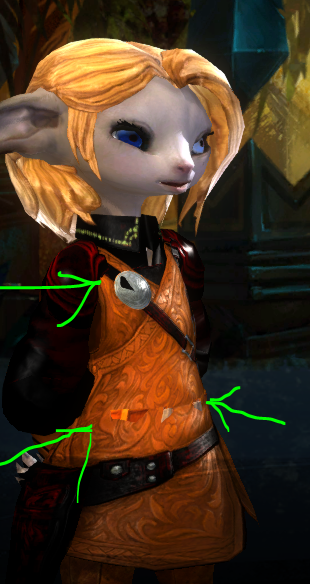 However, the seam disappears when I use "Flamekissed" skins mixing with other skins, because surprisingly, when I tried the same skins on a Human race, there were no seams whatsoever and all skins blend in perfectly, so I assume its an issue with the Norn model? The Demon skill bar is visually bugged and green pixelated crystals move about instead of purple sparkles. the rainbow effect around the Bifrost staff has lost its animation. 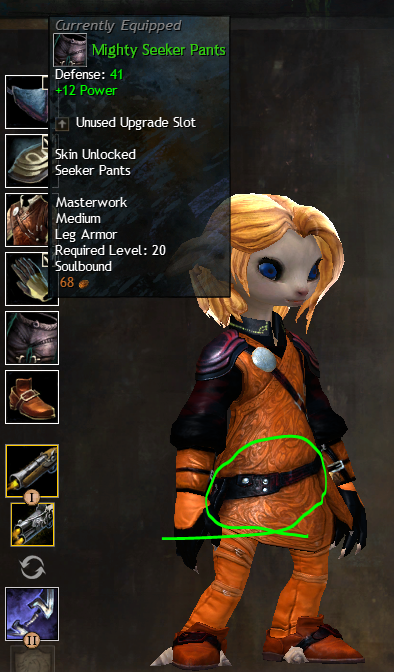 Problem with Armor of Koda Leggins skin. Description: The headpiece's geometry stretches and tears in front of the character's mouth when the mask retracts from its deployed form. As far as I know it only happens in light armor variant and not heavy/medium armor. 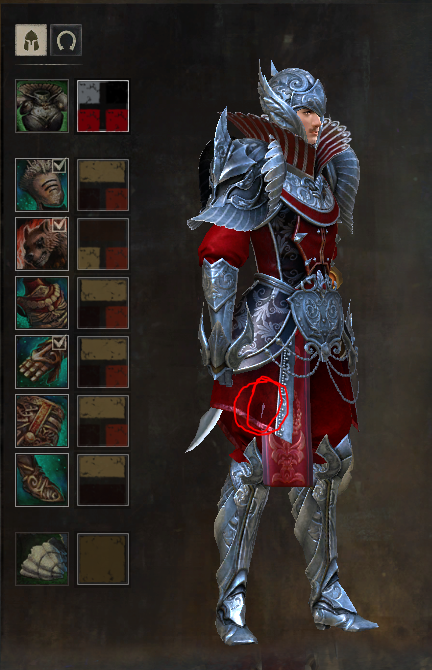 Crusader Hiroki leg armor clipping seems to only appear in story. No matter which pants I select (even the Ascalonian Sentry skin! ), these clipping errors persist with this body type (they are not there with the slender body type 1 = default). The Chestguard piece needs to be adjusted, it is just too tight below the waist for this body type. P.S. The same problem with the Outlaw Coat, by the way, and other medium chest pieces. You can't use it on any body type except default (or the slimmer, boyish one). P.P.S. Image to prove that there was no such clipping error with the skirt part on his thighs when my ranger was less muscular. This is a rather interesting bug: Right in the moment Era was about to despawn she got hit by a knock-back explosion and now she continously remains at the same position, cycling from cast animation to covering eyes to idle. But here is the weirdest fact: As you'll see in the linked image, she has an actual texture rather than her regular summon one. Also it visually seems that nearby players still gain the boon but it doesn't do anything (it just appears in the boon bar). Casting Breakrazors Bastion will not cause the retextured one to disappear but the newly summoned Era does grant the functioning boon to players and despawns regularily. 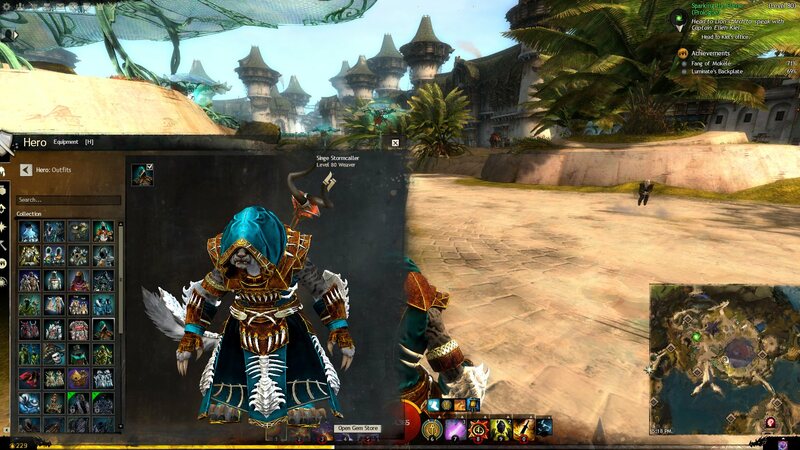 The Dervish outfit ignores Charr Horns and Ears, yet the hood is tailored for the Asuran race, and ignores Charr. New Dervish outfit clips from hood on human female in "battle position"
Greatswords always stick into the ground. 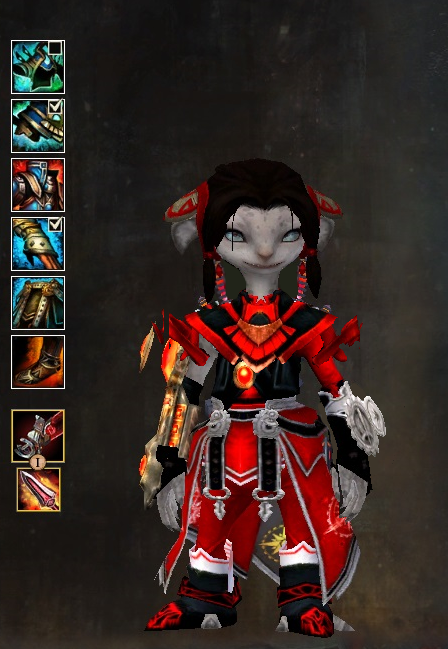 Asuran Cultural Armor Tier 3, Light Armor, Cultural vendor 3 in Rata Sum. How IT SHOULD render: Solution: to fit any shoulder pads, collar have to be erased. The model for Kuda, the Hologram in Sandswept Isles has a hole in her face above her eyes. 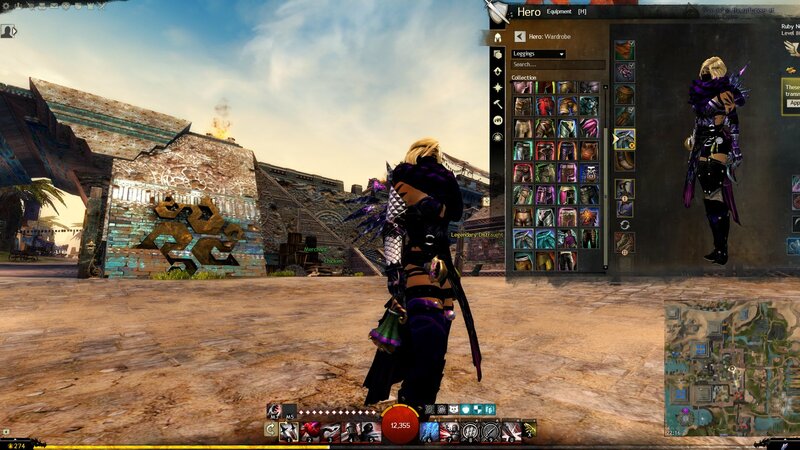 Description: The third dye channel on the Sneakthief leggings is for the metal buckles and accessories on the pants. Unlike the other sneakthief pieces, this dye channel has some kind of metallic grey color tint locked on that channel - if you change that dye channel to say, gold, like I want to do, contrast on that dye channel will shift brighter or darker, but the color tone itself will not shift from the default metallic grey towards yellow. As you can see from the screenshots, none of the other Sneakthief skin pieces that I used have this bug, only the leggings. It does not matter what color you want to change it to - purple, green, red, blue, etc, the metal pieces on that dye channel will only brighten or darken while stubbornly staying a metallic grey color tone. Edited to to correct image links. Gender: Doesnt matter see above. Description: Dye channel does nothing to the appearance of the gloves anymore: It will be the top dye channel when viewing. 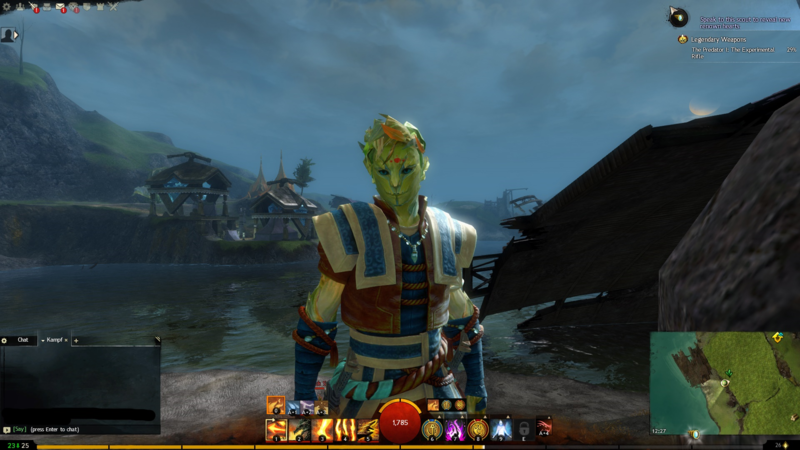 Description: The Monk's Outfit has an issue with the headgear, as far as I've seen only with male Sylvari characters. As headgear the outfit has several points on the forehead. 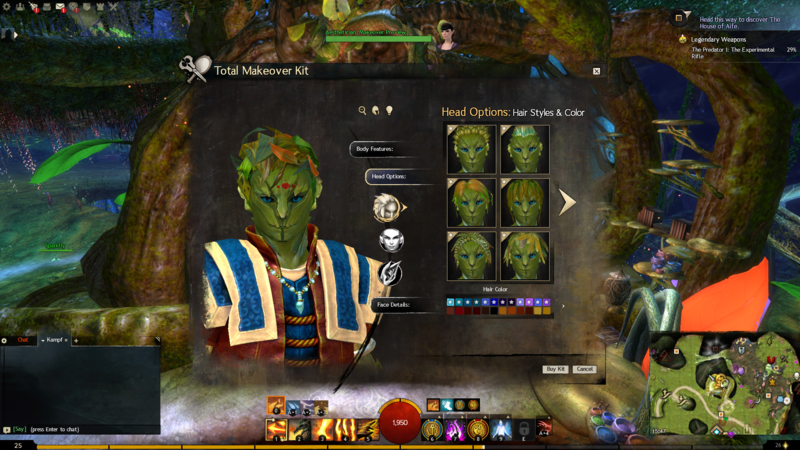 This "headgear" isn't in the middle of the forehead but obviously more on the right side (first picture; male Sylvari). 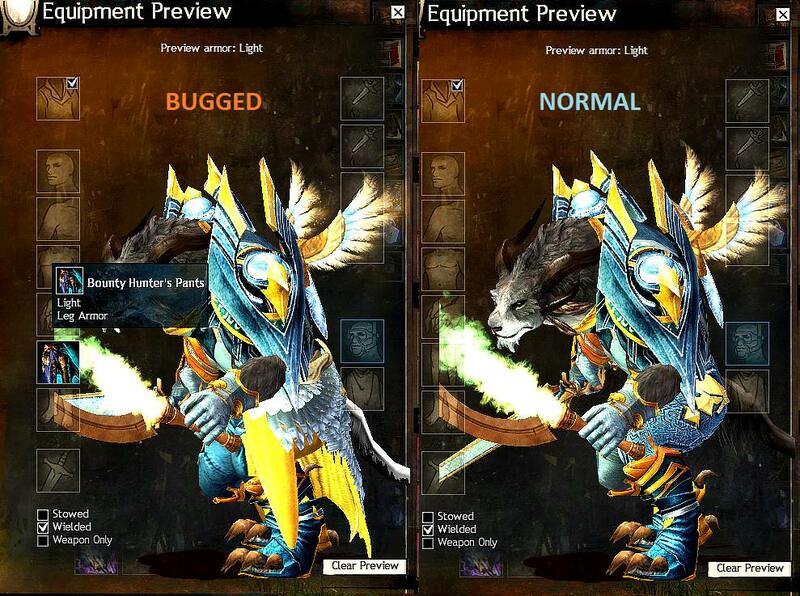 With all other races the outfit works fine (second picture for comparison). It would be very nice if this could be corrected because this issue somehow destroys the "balanced appearance" of the Monk's Outfit and it‘s an item from the gem store after all. To my dismay i discovered after purchasing the Ceremonial Armor costume that the crotchcurtain always clips with the skirt part. No matter the physique chosen it will always poke through. Why couldnt it just be put in the middle like on the female version? Description of issue: When mounted staffs move towards the left a few inches and as you are riding look like they are flailing around compared to when they are in the dead center of the character model. 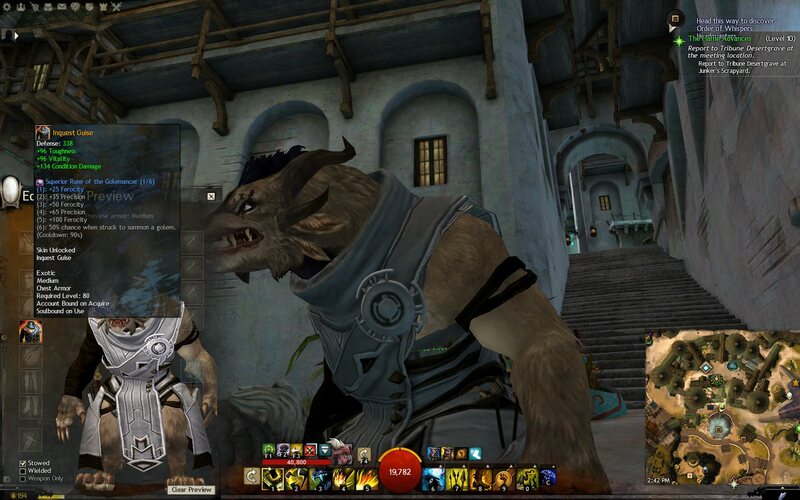 A few days ago, I noticed that my Vigil's Honor Vest clips through a small part of my charr's body, specifically at the front-left side of the character model right around where the body and arm connect (close to the armpit). 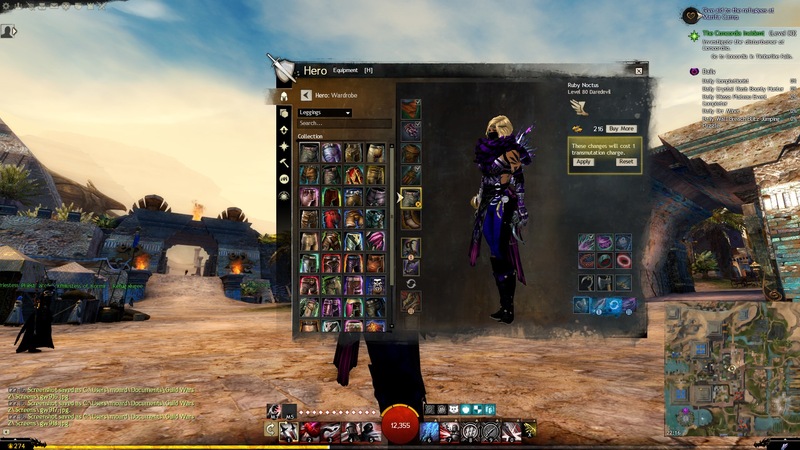 I haven't touched my mesmer in a few weeks so I can't say for sure when exactly this started happening, but I do know for a fact that this is new, as this has never happened before and I've ever had clipping issues while using this particular chest skin. This clipping is not visible while I'm standing completely still (out of combat). I only have the raptor mount unlocked at the moment so I can't provide too much information on how all mounts affect this clipping specifically, but from what I can tell, remaining stationary while on top of the raptor mount or riding and running/jumping around with the raptor mount doesn't actually show the clipping. You can see it easily while moving around or in combat, and as such, walking and running around (out of combat), fighting and performing various actions/attacks of any kind, and standing still and remaining stationary while in my combat stance will show the clipping. Overall, it seems like it has something to do with my left arm and the way it moves in conjunction with the vest, as it depends on how my left arm positions itself. Edit: Not sure if this matters, but just in case; the rest of my armor and the type/skins/style of them, and whether or not I'm hiding other pieces or not wearing anything else seems to be completely irrelevant and does not affect whether or not the vest clips through my body. There's been a consistent face bug for this character's face choice for nearly two weeks now. 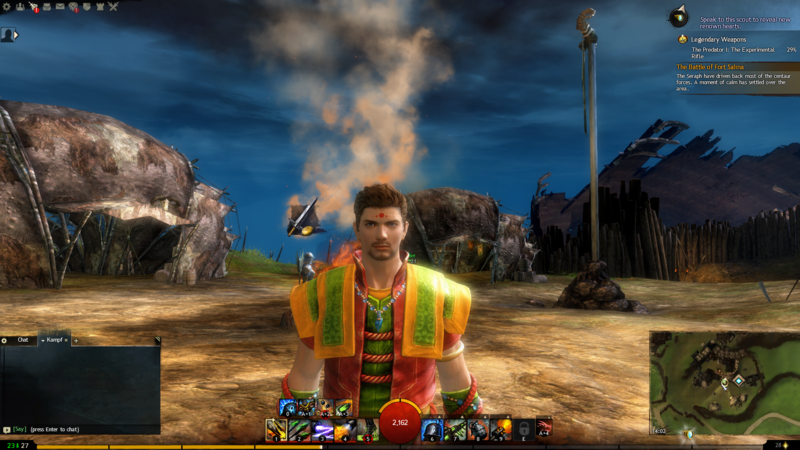 The face appears to be stuck in a visual default, despite changing sliders in preview to maximum or minimum. The bug only applies to the one face type. The bug applies to all other characters if previewed in makeover preview merchant, and has been observed identically in other friends accounts. The bug doesn't change despite reloading, graphics changes or armour changes. I am majorly miffed over the fact that selecting a human male body type heavier/more muscular than the default one will result in severe clipping issues in the upper leg region with many of the medium armor pieces (especially my favorite piece, the Ascalonian Sentry Chestguard), where the pants visibly penetrate the chest piece because the latter is too tight for the body type. Does posting here ever result in a fix for any of the listed issues? 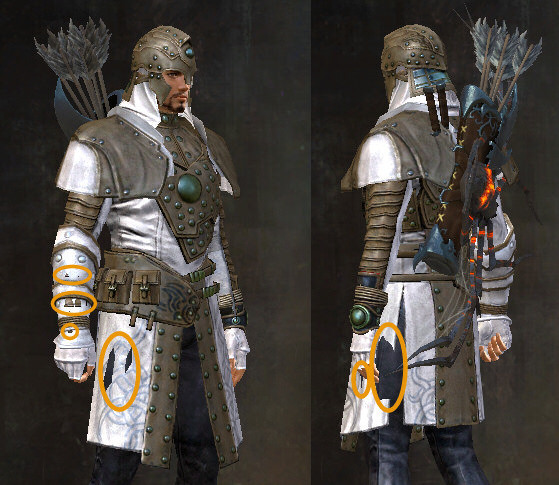 The human tier 3 Assassin's Coat is bugged for whatever reason part of the texture and/or model on the back is anchored to the triceps, rather than following the edge of the rest of the coat. It looks especially bad in motion as it causes a portion of the coat to clip through the back exposing skin. Is there any reason that the Light Zodiac Armor Skin isn't as shiny as the Medium and Heavy ones? Also while you are at it, maybe you can revert the normal map change you did ages ago, I'm pretty sure those people who demanded it gone don't play anymore anyways. Noticed something new about how the back of the coat is bugged, it seems to be tethered to the wrappings on the arms, not the triceps. Another issue is with the Carapace breastplate (and I imagine the luminescent breastplate aswell, although I haven't checked) when wearing the greatsword Eternity. The greatsword is clipped a lot into the breastplate and a lot of it is covered. 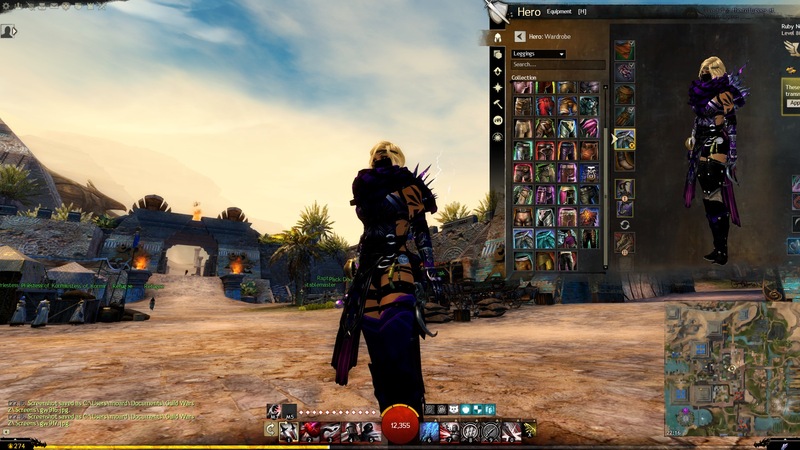 The skirt used in the picture doesn't have clipping in-game, just in the hero panel, so it is not an issue. 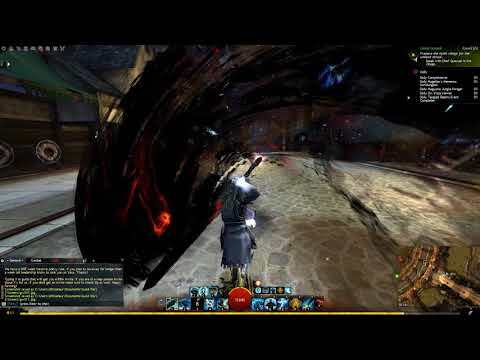 Description: Shield Clips a LITTLE at the bottom on non-legendary armor when cycling through its idle animation. Shield clips MASSIVELY, CHOPPING MY LEFT LEG OFF with legendary heavy armor! Issue: "Deadeye's Rifle" and "Cursed Flintlock" float abnormally far away from the body when sheathed. Description of Issue: The actual FX for the item do not show in the proper place, in the preview window they have them in front of the Characters eyes like the Glints Masks, In actuality in game they are BEHIND the eyes and the effect is not fully visible. Come the day of its release, imagine my dismay when I foudn out this beautiful norn styled helmet gets rid of arguable one of the most defining features of a male norn, their beards, forcing you to bare weak-chinned baby face. Don't you know a beard is a source of a man's power? Why shave your face and wear the chin of your infancy! A beard is a commitment to courage! A beard is a commitment to honor! A beard is a commitment to the hero within, bursting forth from your face! Succumb not to a life of shameful beardlessness! A man who wears a beard wears the face of his true self, not the man he was but the man he chooses to be! Give courage to those poor souls enslaved in a life of woeful beardlessness. We must encourage more beards in the world. Each man with a beard gives that much more encouragement to all his brothers living a life of shameful shaven slavery. A man is born with one face, a young face, a weak face, a novice face, yet as he finds his true self, his beard bursts forth from the face! Can you name, in the history of the world, one heroic beardless man? No you can't! Do it for yourself! Do it for man (and norn) kind! Do it for the glory of the beard! Shave not, lest ye be shaved! 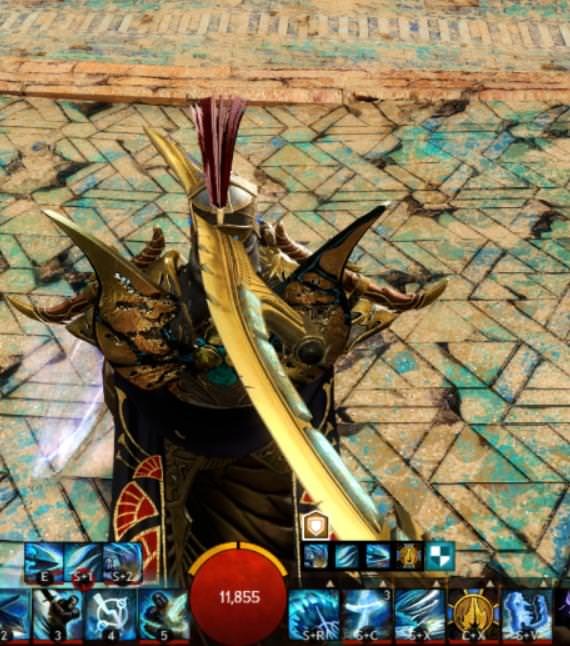 Whenever you toggle walking, the Desert King Greatsword goes right through your character's skull instead of resting comfortably on the shoulder. This picture has been taken from the back. 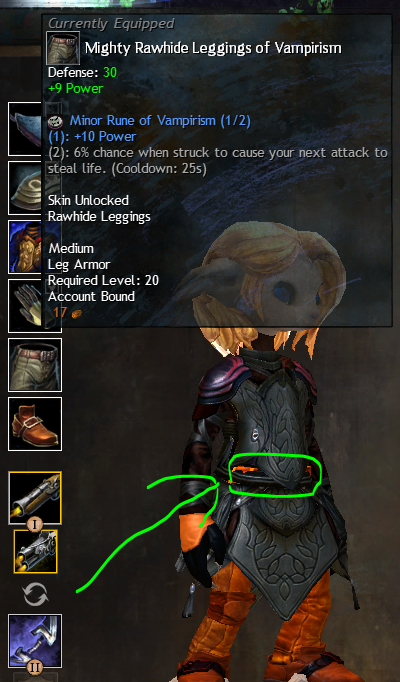 There seems to be a new problem with atleast Norn female medium leg armor. 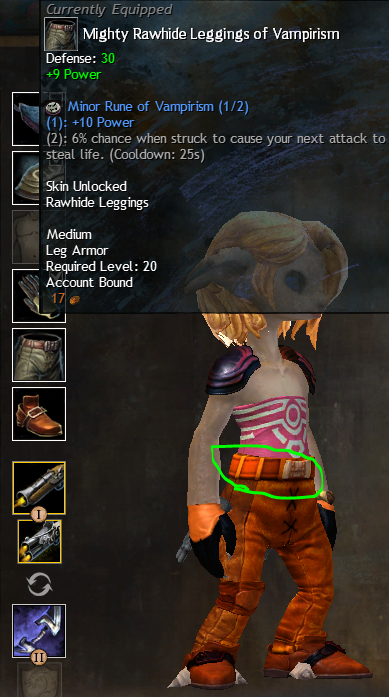 On some skins the weapon sheathed attach points have sunken into my characters hips! Here's some examples, but this isn't just these pictured skins which are affected. Description: Rigging issue on the right side of the vest; the seam of the clothing stretches out along with the right arms to wherever it moves. Description: There are numerous issues of dye color overlap between the cloth, metallic, and gem details/regions that make them lump together when they should be separately customizable. There's a gap in the mesh in the left armpit where you can see right through the character model. You can see the green name tag of the "Administrative Assistant" I'm standing in front of in this picture. 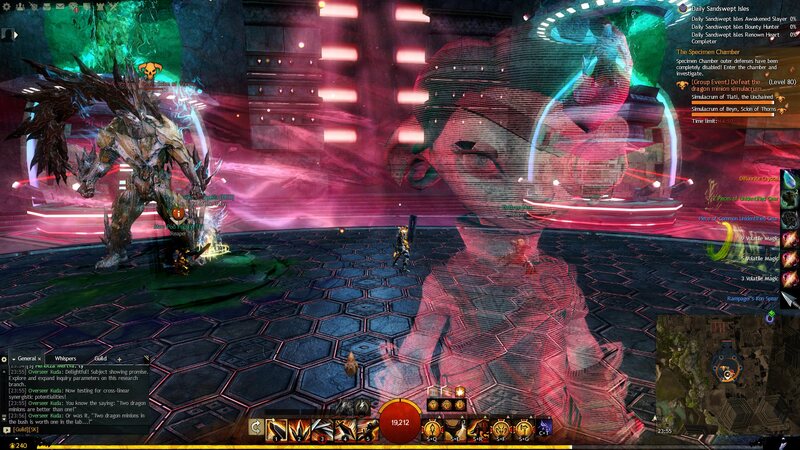 ALL Axe blades (when the weapon is stowed) pierce through my male Sylvari's left thigh. It looks awful and limits the number of axe skins I can use to less than a handful (and even those pierce slightly through the texture). P.S. The whole Ascalonian armor set in particular is bugged (more than other sets!) for all weights when you are using the non-default body model.